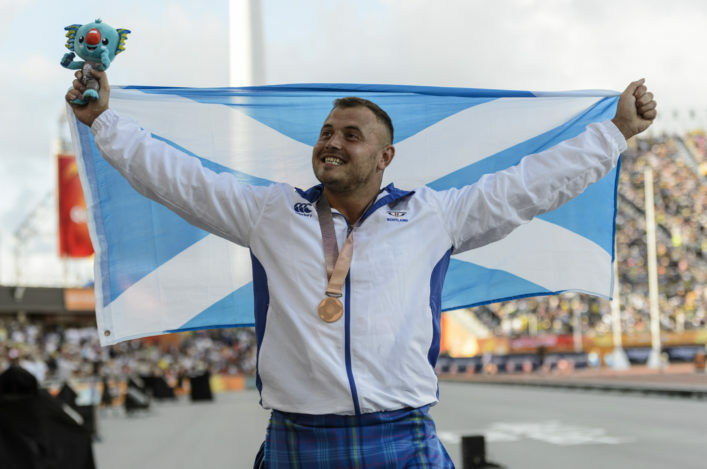 Magnificent Mark Dry claimed Team Scotland’s first medal in Gold Coast 2018 athletics – with bronze for the second time in four years in the Hammer at the Carrara Stadium. 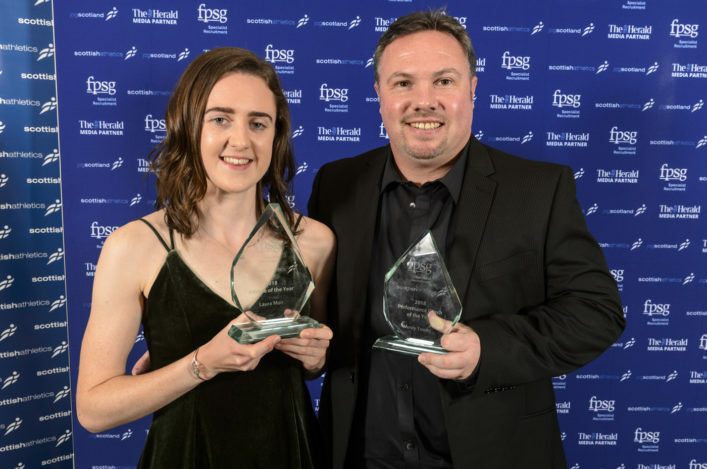 It was the opening event in the track and field programme and remarkably the 30-year-old defied medical science to replicate his Hampden heroics. 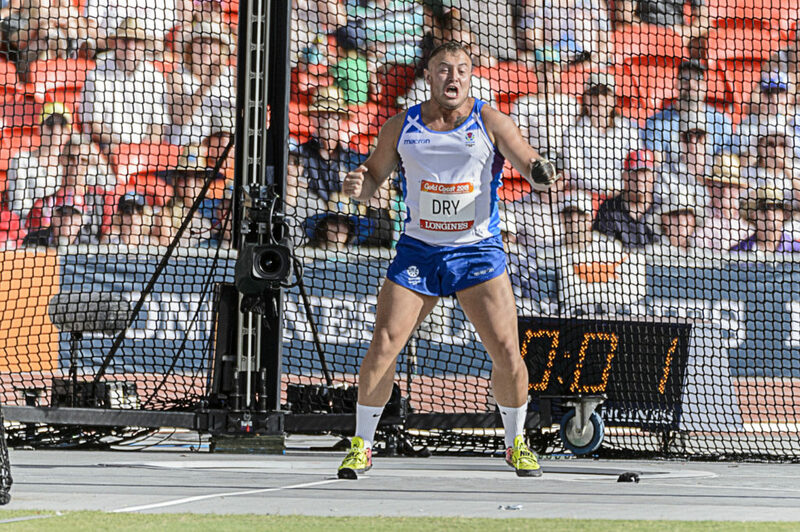 Dry has had hip surgery twice in the past couple of years and was on crutches as recently as January this year but a last round throw of 73.12m had him leaping around in ecstasy in Australia. England’s Nick Miller won the gold with an awesome Games Record throw of 80.26m and Australian Matty Denny took silver with a PB of 74.88m. Unfortunately, Chris Bennett, didn’t make the cut for the final eight athletes with his best only at 65.22m. Dry memorably wore his kilt to the medal ceremony after bronze at Hampden and he had the Team Scotland Gold Coast tartan attire back on over his shorts when he stepped into the stadium today. 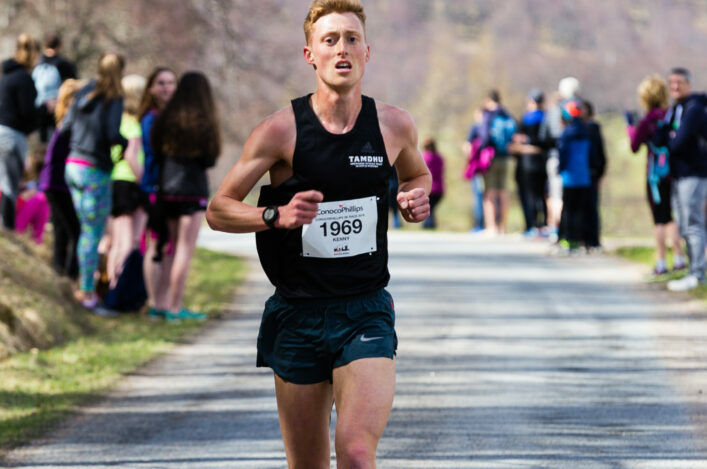 ‘I came out wearing the kilt and I’m not saying that made me think I would medal or anything like that but it was just that I am so proud to be here and represent Scotland. ‘I knew I hadn’t thrown well in Brisbane the other week there and I know I am not in great shape, physically. I have had to modify so much of my training because of fitness issues with my hip and so on. I’ve had surgery on my left hip twice. ‘The day before the event I adjusted my throwing style again because I knew the way I had been doing it would not be enough. You have to try and be competitive. Dry finished sixth in Delhi in 2010 and then took bronze at Glasgow 2014. ‘I loved it at Hampden and Glasgow will always be special for me – I had lived in the city and I was surrounded by happy Scots,’ he said. 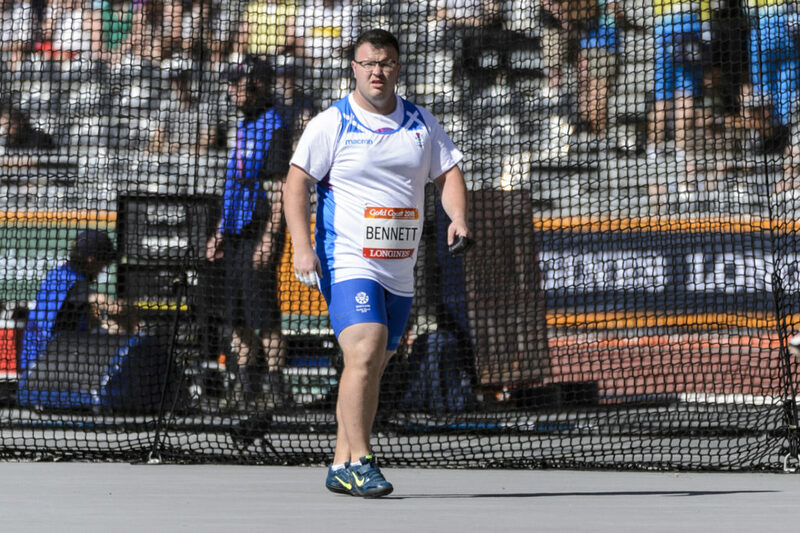 Bennett had come into the event in strong form, with wins in two warm-up competitions in Australia with throws over 74m. But, as it transpired, his first throw of 65.22 was the best of his three and that was to prove not enough to make the cut for the final eight athletes. His second throw was no improvement and, needing something better on the third throw, the hammer flew just outside the quadrant. When Nick Miller stepped up next to go into the lead with 76.48, it was all over for Chris in terms of contesting the medals. ‘I just feel I have let so many people down,’ said Chris. ‘That is even harder to take than Hampden. I came here in good shape and then threw really well in the warm-up comps with 75 and 74 and trained well in between out here. Everything was ready, everything seemed set-up well. So it is simply down to me. It’s my fault. 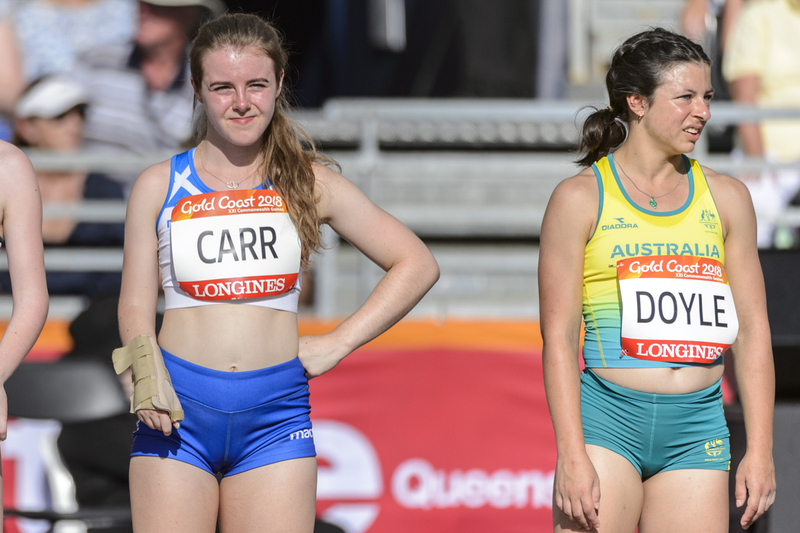 Amy Carr finished seventh on the F38 long jump with a best leap of 3.65m. Amy, who is a F37 athlete, was competing up a class in the event with F37 athletes also eligible but a T38 event. ‘That was such an amazing experience to be here and jump in that competition,’ said Amy. 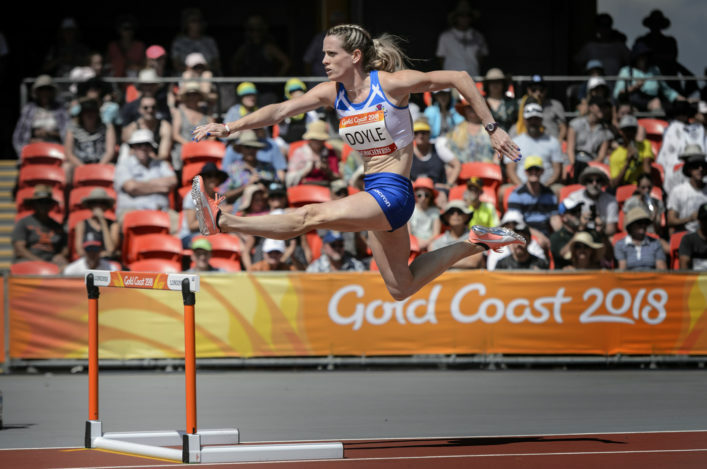 ‘It didn’t quite go as I hoped in terms of the jumps and the sequence but to compete against athletes from around the world is something I will learn from this.